A lot of gamers hate LJN, and honestly, their track record is often deserved. They were always part of the greater film merchandising plan, and there was never much incentive to create a brilliant product – these games were always intended to sit on the same tier as action figures and branded bed sheets. However, LJN’s games do consistently pass what I consider to be my major criteria for a movie tie-in: the designers have actually seen the movie. 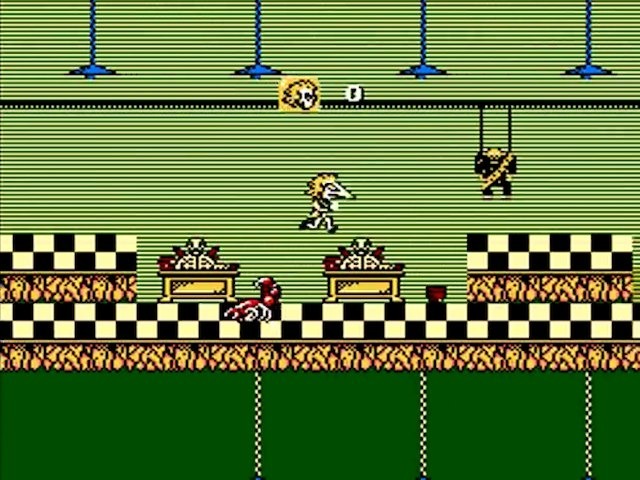 Beetlejuice isn’t a great platformer, and it’s a fairly abstract take on the film’s events, but at least someone clearly put some thought into the references. Scares give Beets a means of attack, along with temporarily changing his form. 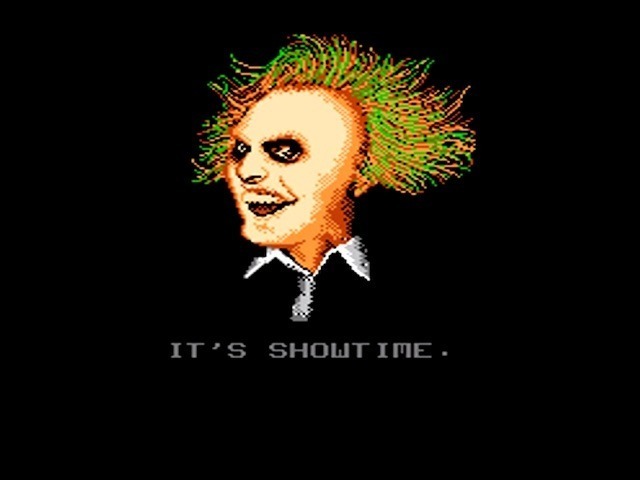 You play as Beetlejuice, a professional spook-for-hire who “specializes” in scaring off the living (In the movie, he’s a sleazy con-man, in the game, he seems to actually care about doing the job). You’re tasked with running the Deetz family out of an elaborate art deco mansion. 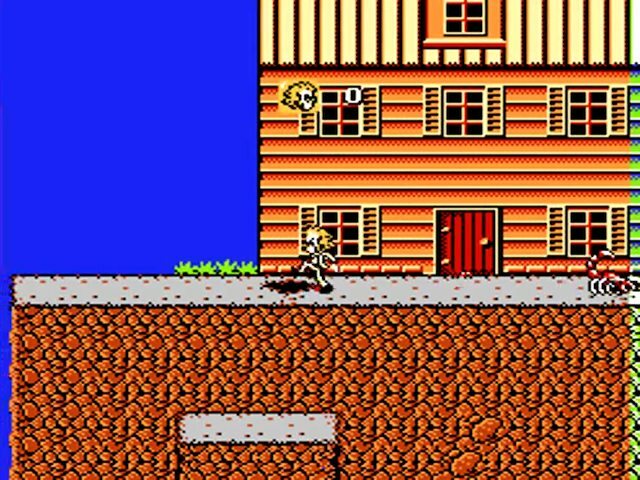 You’ll navigate the side-scrolling afterlife to infiltrate the house, then collect a series of keys and special items to scare off each member of the family, before finally collecting your number in the Afterlife waiting area. The manual then insists you’ll be whisked off to “Ghoul Heaven,” though that doesn’t seem like the kind of thing movie Beetlejuice would be interested in, if you know what I mean. Gameplay comes in two forms. 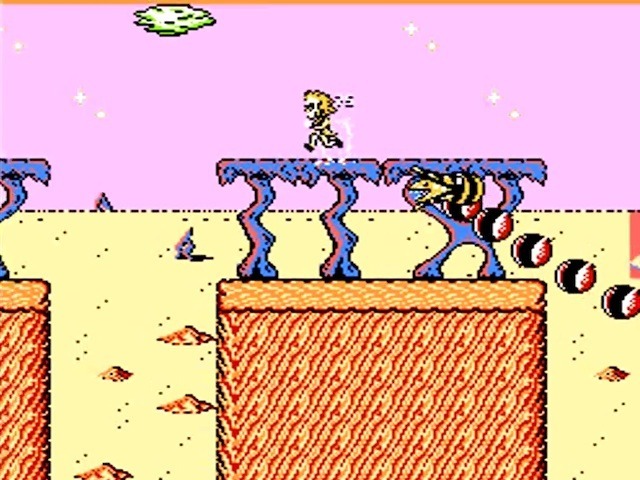 The first three and last two levels are side-scrolling platformers. A collection of monsters and insects harass Mister Juice, and you’re usually expected to dodge them – floor critters are immune to all attacks. Others, like bees or squids blocking your path, will be dispatched through use of disposable scares. These are bought in stores throughout the levels and selected from the Start menu. They are often designed after creatures from the movie, such as the “bird man” mask or Beetlejuice’s snake form, but every one of them simply shoots fireballs with the B button. More expensive scares hold more shots, with the least expensive throwing just a single fireball before reverting you back to your standard form. Die beetles! DIE DIE DIE DIE! Scares are bought from a store run by the guy with the shrunken head, by using “help vouchers” (more nods to the film); a currency collected through defeating enemies and stomping bugs. Because someone took “beetle juice” a little too seriously, you’ll get points for crushing an infinite supply of bugs that scurry out of the occasional hole. Stomping them with the B button grants currency based on the color of the bug. These get up to 75 points a pop, so it’s astonishingly easy to build up a huge supply of scares, if you have the patience for it. There are no time limits anywhere in the game either, making this yet easier. Once you’ve made it to the mansion, gameplay shifts to an overhead view. 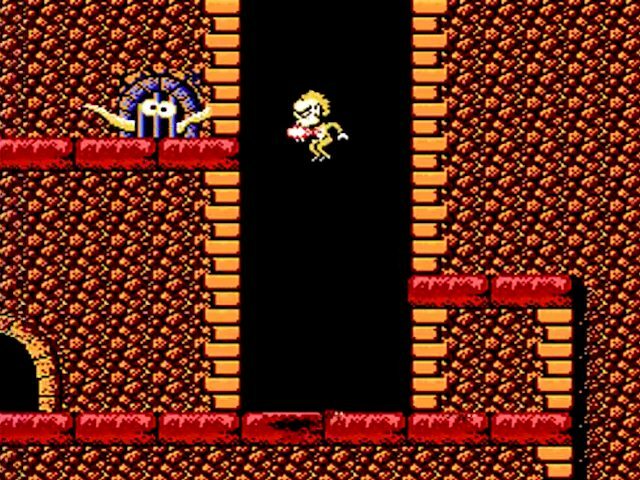 You’ll need to navigate individual maze-like floors, looking in boxes for the item that will dislodge one of the movie’s characters blocking the level’s exit. Beetlejuice will give hints in dialogue screens, but there’s no choice involved – it’s a simple matter of finding the hidden object and deploying it with the Select button. Instead of your usual scares, you’ll get collectable bottles to throw, or items like the hammer which ricochet around and bump off a new collection of crawly creepers. 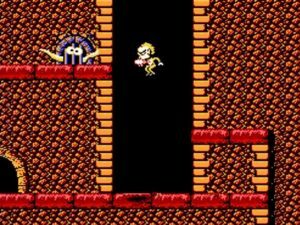 Finally, similar to the dungeon hands in Legend of Zelda, doors will chase you around the mansion levels and warp you if they catch up. Again, in a nice touch to the movie, the doors send you to Saturn and force you to fight a sandworm before you can return. Run from Deelia’s statues and that accursed door chasing you. With so many nods to the film, it’s strange that the game elects to go with something confoundingly dumb and generic for its first two levels. Beetlejuice must jump across clouds, avoid beams of light, a shark in a bathtub, and an angry pest exterminator before going for a canoe ride in the sewer. 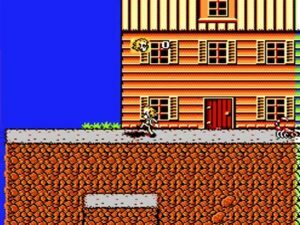 It’s NES Logic game design, and you’d be forgiven for thinking the rest of the game was going to be an equally lazy platformer. Even with mansion floors devoted to every character in the movie, I suppose they needed to pad the game out and thought a “prequel” sequence was as good a choice as any. The impression these early levels leaves proves them soundly wrong. Not to say the mansion is the best part of the game – mechanically, it’s quite the opposite. 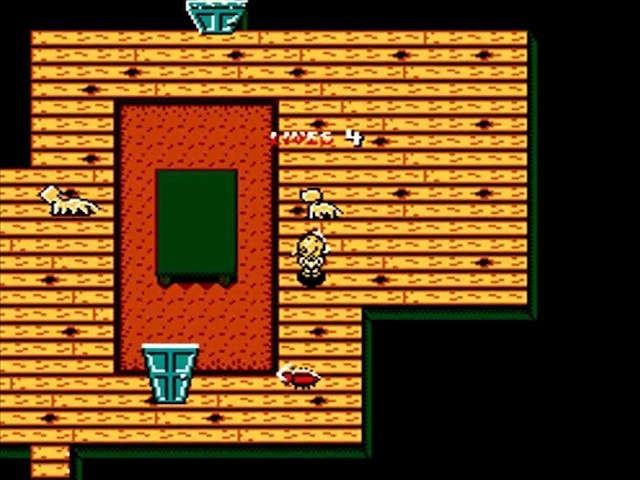 Floors are full of dead ends that trap you between bouncing enemies and the nefarious ghost door. Some rooms scroll, pushing you always ahead, and taking the wrong path here immediately loses a life. A later floor has you passing between endless groups of doorways, looking for the arbitrary combination that leads to the exit. Unless you know exactly what you’re doing, the mansion only stands to frustrate. I’m sure it’s another attempt to force multiple plays and draw out the “value” of the package. Beets controls okay, at least. His platform jumps are high and floaty, but you can steer in midair and it’s reasonably easy to hit a distant ledge. Most floor enemies are designed to be avoided, so precision landings aren’t exactly required anyway. The only real annoyance here is that the screen doesn’t scroll up or down with you, so hitting the borders results in instant death. You’ll need to hit a lower platform and wait for the screen to catch up first. A few required leaps (well, drops really) of faith grind this in further. There’s no jumps or precision at all in the overhead areas, it’s easy enough to navigate, and most of your challenges will involve dodging any skittering bugs. They definitely hit the highlights of the film, even if the execution doesn’t. Music and effects are woefully generic, which should be no surprise. Artwork is actually pretty good. You get a decent rendering of Michael Keaton’s mug with every dialog screen, and as said, many of the scares are taken right from the film. Goofy sewer squids with googly eyes and killer bees don’t exactly fit the film, but at least the final “Afterlife” stage nails the art deco hell of the movie, complete with the flattened office worker chasing you down. The different versions of Beetlejuice when a scare is activated are also done well and feature plenty of variety, from turning him into a walking skeleton, to giving him the carnival head from the end of the flick. If you struggle through, you’ll get a lame congratulatory screen, so the journey is absolutely the reward. In that sense, Beetlejuice is not terribly rewarding. I give them respect for both sensible movie references and the variety of two different perspectives and gameplay styles, but like so many other titles, they try to hide the lack of a full game behind trial and error and forced replays. Slightly better than you might expect, definitely a much better movie game that you expect, but still a mostly dull time. Check out Haunting: Starring Polterguy for something closer to the Beetlejuice game you’re likely expecting. Full of nods to the film. Various scares look great. Two different styles of gameplay. Easy enough to control. Platform sections are pretty generic. The mansion sections are drawn out with mazes and trial and error.